Today I followed route 1 inland and over to the south coast. Many small towns, half of which seemed to end in "up". Also considerably more hills, so a longer day. Overcast skies as I left Bunbury. Rode 5 km back from the peninsula and then a fork in the road. Take route 10 to the SW or follow route 1 around and inland? In the end decided to follow route 1, though not without riding briefly on 10. The sights seemed as interesting this way and also likely to be slightly drier. 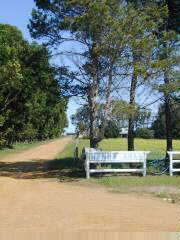 Out of Bunbury was farming landscape. Many pastures with cows and horses. Forests with reasonably tall trees. In fact forests all day long. After 24 km, stopped at a bakery in Boyanup for a bite to eat. Friendly owners who told me about the last American cycle tourist from NY who had been through several months ago. Across the street kids waiting for the school bus. After Boyanup, a brief shower but also a little sun. Log trucks on the road; empty going my direction and full coming back. At Donnybrook I made another brief stop at the post office to mail off disks with photos. Donnybrook claims to be "home of the Granny Smith apple". I saw many orchards both before and after Donnybrook. In addition to apples, also pears and other fruits. Trees hadn't blossomed yet since it is not quite spring here. After Donnybrook, several short hills to climb over. Not much in the way of shoulders or views, but traffic gave me as much room as it could. From Kirup considerably more hills as I rode through Balingup and then into Bridgetown. Overcast skies had returned and it was starting to drizzle lightly. I had ridden 94 km with many large hills and it was tempting to stop for the day. However first got lunch for the day and viewed the jigsaw museum in Bridgetown. When I first saw "jigsaw" thought it might have to do with trees or woodworking, however it was actually a jigsaw puzzle museum with large puzzles and also a table with a new puzzle in progress so visitors could place a few pieces. The town had a nice downtown with many small shops. In the end, decided I would get a few more km in for the day. Folks at the info center promised me less hills ahead. Riding from Bridgetown was one long gradual hill the first 12 km to Yornup. However, true to word, less hills than before Bridgetown. It alternated between slight drizzle and dry but still reasonable riding. Railroad tracks were along the way and also had a train pass. Still continued with farming country. Most of the moisture here arrives between April and October and fire bans are in place for other parts of the year. Late in the afternoon as I arrived at Manjimup. There was a gateway on edge of town (gateway to the tall timber?) and then four blocks of downtown and several motels to pick from. Stopped in at the visitor center and also at the supermarket. It was too late to see the timber museum. I have now ridden over 10,000 miles since March 1st. More miles than I usually put on my car in a year. 129 km today, 16141 km cumulative. Today a hilly ride through tall forests. Several nice multi-kilometer descents and many smaller hills. However, none steep enough to require my small granny gear. Farmlands in first 30 km but mostly forest thereafter. Rain falling as I awoke gave me reason to dawdle, walk to the bakery and repack gear in plastic bags. It worked as rain changed to drizzle as I left. Off and on drizzle today. After 10 km reached the Diamond Tree Lookout. Here is a large lookout tower 52 meters on top of a karri tree. A sequence of spikes driven in the tree form a ladder one can climb. I was happy to view things from below. At 16 km a turnoff to Pemberton and also signs indicating log trucks for the next 100 km. Surprisingly didn't see any trucks for the rest of the day. Hills increased in size from this point forward. Around 52 km stopped at Shannon National Park. Nice visitor displays describing the logging industry and former town of Shannon. Logging stopped in this area in 1983. Shannon National Park comprises the complete watershed and includes many walking trails. At Shannon was talking with a park employee who asked if I'd heard the news. Nope. He filled me in on events in New York City and Washington DC. Wow! Didn't know details yet, but still surprising and shocking. After Shannon climbed out of the drainage and through the hills. Still tall forests through more wetlands as I came closer to the coast. A few farms at 108 km in Crystal Springs. From there a sharp descent to Deep River and then large hill to climb over before arriving at Walpole. Walpole has a nice row of small shops and two supermarkets. Saw another touring cyclist heading the other way. Stefan was a Swiss cyclist going to Perth. We traded information about respective routes. Also caught up a bit more on news this evening (John Howard, the Australian PM happened to be in Washington DC and Bill Clinton was in Queensland at the time; lots of news reports here about events 12 hours behind in US and local effects as well). 119 km today, 16260 km cumulative. An easy ride today. I left a bit later than usual, but still made it to the Tree Top Walk, 20 km away, when it opened at 9 am. First 14 km of this ride were mostly uphill along a road to the "Valley of the Giants". The tree top walk is a sequence of platforms and walkways that brings you to the top of the forest canopy some 40 meters above the ground. Small signs explain flora and fauna of the area. The narrow walkway bounced slightly between platforms, but still had good rails. I also walked the ground trail around the bases of some of these huge trees. 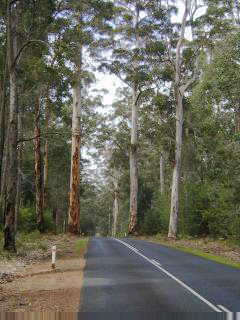 After leaving Valley of the Giants, I took a back route another 13 km around and back to the main road. Quite a few pastures and dairy farms in this stretch and for the rest of the day. About 2 km after rejoining the main road saw a sign for "Parrot Jungle" and went to see this attraction. They had cages with about 15-20 different types of birds. It was interesting to see some of the species I've otherwise seen in the wild. From parrot jungle more rolling countryside until I came to the town of Denmark. Denmark had a cute small town center with several bakeries and fruit stores. Decided to take an easy day and explore the town. There was a small historical museum with artifacts from early settlers. Ian Conochie started the museum in 1983 when he "realized that so many old folks were falling off their perches without their stories being recorded". They now have 160 people on tape and staff the museum with volunteers. The town was settled in 1895 as a timber town. It declined after mills were closed but has recently been growing with tourist trade. Overcast but otherwise dry today. 76 km today, 16336 km cumulative. Another short day and an easy ride. Winds from W/NW so nice tail winds to blow me along. Hoping for more of these prevailing winds as I head eastwards. Left early and was in Albany shortly after 9 am. Albany has two bike shops and so decided to have things checked over before heading for more remote parts again. Meanwhile got a chance to look through the town. Mostly flat terrain. Many pastures with dairy cows and some sheep. At 17 km I took a turnoff to the tourist route via Old Denmark Road. This came past cute shop at Youngs Siding and then over Torbay Bay. Windmills on the hill were twirling at full speed. I followed the route the last few kms into town and then asked for the bike shop (Darryl in Geraldton had recommended one, but when I asked for it, I was directed to the other bike shop). Asked them to do a check and walked around town. Albany was established in 1827 and is thus the oldest town in Western Australia. The British sent a brig, the Amity, from Sydney to establish the settlement in the west. The passengers included 21 soldiers, 23 convicts, a storekeeper, a surgeon and also crew of the ship. They landed on Christmas Day 1826 and formally proclaimed the town of Frederickson in January 1827 (the name was changed to Albany in 1832). Past history includes whaling, timber and some mining. I found the tourist information center and followed a route around some of the historic sites. There was a replica of the Amity (which wasn't built for tall sailors), two churches, a cottage from 1832, the old jail, a museum and several old commercial buildings. I thought the Amity replica, the old jail and Patrick Taylor's cottage were particularly interesting. At the end of the day, I retrieved my bicycle. All looked well. The chain has stretched a little, but I decided to keep current cluster and chain for now and look at replacing it around Port Augusta. 56 km today, 16392 km cumulative. Today a longer ride through agricultural areas. Close to Albany were many sheep and cows. In middle of the day were several tree farms. The last half had wheat and canola fields again. Brisk winds from the west so mostly tailwinds to push me along. Early start from Albany. A few low hills to climb as I left town. Came to a roundabout and was quickly heading on route 1 towards Esperance. A few more hills and I was at Manypeaks at 40 km. Here was a small rural store with advertisements for herbicides, fencing, fertilizers and other rural products. In the distance was Mount Manypeaks, appropriately named. After Manypeaks many tree farms along the way. A few gentle hills but mostly flat. Nice tailwind to blow me along fairly quickly to Wellstead at 99 km. A lunch stop here. At 113 km a steep descent down to the Pallinup River with a slow climb for several kms out the other side. At 118 km was Boxwood Hill with the Rose Roadhouse. The roadhouse had some of the least friendly owners I've met so far. It started when I leaned my bike against the brick wall. The asked to move it to the metal wall. They asked where I was from and then made a snide remark (unlike most others who typically relate some sympathetic comment concerning recent terrorist events in the US...still the headline story in the news here). I was happy to leave there and get going again. In this area was Fitzgerald National Park with info signs describing many species found. After this point also came more fields. Fortunately more tailwinds to blow me along until 146 km. At 146 km, road turned northwards and my tail winds became a cross wind. A few more hills as well, made for slower riding. At Jerramungup I found the hotel/motel and asked for a room. They said all motel rooms were full, so I'd have to be in the hotel. They handed me a key to room three. I opened the door and surprised someone inside. No worries, here is key to room six. However, in room six the bed was unmade and there was a suitcase. No worries, here is key to room five. In five the bed was unmade, but otherwise ok...However, once the owner came he said that five was occupied. So this time, I traded keys one last time to a motel room after all. Walked briefly through Jerramungup and saw rather nice rainbow off to the east. 178 km today, 16570 km cumulative. An easy Sunday ride. The route went through agricultural lands again with wheat, canola and sheep. Immediately next to the road was scrub, but a few hundred meters behind I could see fields. Many of the plants along the road were in bloom with yellow, deep purple, orange and white flowers. I was riding across the drainages. This typically meant a nice 4-5 km descent followed by an equally long slow climb up the other side. In this fashion, I crossed the Gairdner, Fitzgerald, West and Phillips River drainages. Left at 6 am and had ridden the 114 km to Ravensthorpe shortly after noon. Ravensthorpe was an agricultural center with large silos outside town. Several older buildings as well as newer police station and roadhouses. Most places closed on a Sunday, but there was a nice tourist information center. East of town is the rabbit fence again, so a bit of information I found out. Rabbits were introduced in Victoria in 1859 for hunting. Things quickly got out of hand and the rabbits multiplied like rabbits. By 1894 they were crossing the Nullarbor. The WA government started a fence in 1901 to keep them out. This fence was then joined by two others. The longest fence was 3256 kms long. There is still a fence of 1170 kms maintained in WA. Rabbits have declined due to diseases and poisoning, but the fence is still used to keep out emus and other wildlife. The local shire is having a celebration next Friday to commemorate the 100 year anniversary of the fence. 114 km today, 16684 km cumulative. A long ride today. There weren't motels or caravan parks right along the way, so my choice was to either make a long ride or camp beside the road. Beautiful clear skies. I didn't notice much in the way of wind, so most likely tail winds. The route crossed several drainages. While not as steep as yesterday, they still meant a slow downhill and then a slower uphill ride. Fewer wheat fields than before. However yellow canola fields and pastures with yellow flowers made for bright contrasts with blue skies. I left at 5:30 am. My eastward progress and coming spring means every day it gets light a few minutes earlier. Cool enough that I put on my wool mittens for the first downhill. Looked down and then notice I had forgotten to top up on water. Still had two liters, so enough for now. A few rolling hills past Ravensthorpe. I came past Fence Road, presumably for the rabbit proof fence. However the fence doesn't appear to come right up to the road. At 81 km was Munglinup, the only town on the route today. Brief stop at the roadhouse for a bite to eat and a fill of water before continuing. Kept getting warmer this afternoon. Terrain in the afternoon was similar: cattle, sheep, canole and some tree farms. Gentle rolling terrain. Signs pointing to Stokes National Park off to the coast. Bright blue ponds amidst fields with yellow flowers. Slowed down as I got more tired. At 157 km was a turnoff to Gibson (22 km away). Gibson will be on my route tomorrow, so see how much of a short cut this will be. Kept going from here the last 30 km into town. Esperance has a population of 13200. I rode into the center of town and found a nice motel. Was already past 5 pm when I checked in, so did a quick look around downtown. Nice harbor here as well. 187 km today, 16871 km cumulative. An easier ride today. Went parallel to the railroad tracks and along some small agricultural towns. Signs on a few farms indicated types of sheep. Fields of wheat and canola continued. There were occasional ponds. Also, the sides of the road looked occasionally wet, though the wheat fields looked poorer than near Geraldton. Salmon Gums is the last of these towns, so expect I'll be through more scrub tomorrow. Skies mostly clear as I left Esperance. A few km through industrial parts and then into more rural areas. The airport was 20 km out. Currently Australian airlines are in a bit of a turmoil after Ansett suddenly stopped operating this past week. Ansett and Quantas and their subsidiaries shared ~90% of the market. Esperance was served only by Skywest, an Ansett subsidiary...so has temporarily lost air service. At 26 km was Gibson, population 190. Here was the Gibson Soak Hotel as well as a small store. If I'd taken the short cut to Gibson yesterday, I'd have saved 34 kms on the route. As I passed Gibson, I came past some territorial magpies. They kept swooping at my red helmet, presumably to chase off the intruder. At 52 km was Scaddan. The only store was closed, a "going out of business" sign still painted on the outside of the building. On way to Scaddan, it became much flatter. At 78 km was Grass Patch. There was a small tavern/store here, though I had to call out to get someone to ring up a purchase. Also across the way was a memorial to Leslie Thomas Starcevich. Tom was recipient of the Victoria Cross for bravery during WW2. They had also named a street after him. The fierce memorial of him with his bren gun was opposite a more peaceful memorial to early pioneers. At 107 km was Salmon Gums, biggest town since Esperance. There was a roadhouse, post office and hotel/motel. Got lunch here and decided to stay for the night. Nice to have a shorter day, particularly since it rained in the afternoon. I had accidentally dropped my camera on table yesterday at end of a long day. Looks like my inside shots are ok, but outside comes very over-exposed and saturated. Not certain what is going on, but doesn't look good. Brendan and Wendy stayed here last night, so I am one day behind them again. 107 km today, 16978 km cumulative. Today a short ride and day to prepare a few things for crossing the Nullarbor. A nice south tailwind this morning meant I made it to Norseman by 10 am. As expected there were fields for another 30 km or so and then mostly scrub. A few slight hills, particularly leaving Salmon Gums. The road had long straight sections of 20-30 kms long with just small bends. The road followed the railroad tracks and I saw one train headed towards Esperance. After 40 km were several small ponds and also some dried up ponds with white salt still visible on the sand. At 74 km was sign for a gold mine. This area was settled due to a gold rush in the 1890s. There is a statue to "a horse named Norseman", after which the town is named. According to the story, said horse was scratching the ground with his hoof and uncovered a rich gold reef. Since then some five million ounces of gold have been taken out of Norseman, making it the second richest goldfield in WA. Norseman is a small town of ~2000. I found a place at the old railway hotel. This was a large grand building with pub below and rooms above. Room was $AUS 20 and I expect I was one of the only guests. While in Norseman, I took care of errands: laundry, groceries, internet cafe and otherwise walked through town. My digital camera definitely looks zapped, so got a non-digital one for now to still get a few shots. Norseman is on edge of the Nullarbor Plain. From here to Ceduna is slightly over 1200 km. There is one town (Eucla) and a set of roadhouses. Nullarbor is poor Latin for "no trees" though I'm told much of this route will have trees. Tourist literature describes the Nullarbor as "world's biggest single lump of limestone - 250,000 square kilometers". By my estimate, this is almost the same area as Colorado. From my examination of the map, it doesn't look more remote than other stretches I've already ridden, e.g. Kununarra to Broome or Broome to Carnarvon. However, the Nullarbor still has name for being vast and remote. Tomorrow I'll start riding and see about the comparison. 97 km today, 17075 km cumulative. Today a slow ride against a headwind. Despite the Nullarbor name, still tall eucalyptus trees today, so hope the wind shifts before I reach areas without trees. Left Norseman with a full load: eleven liters of water and extra food. Town was still quiet as I rode through. Stopped at roadhouse on outskirts and had brekky before setting off. From Norseman there were a few low hills to climb over and then slightly rolling terrain. With exception of the gap between 46 and 100 km, road was smooth with wide shoulders. Light wind as I left, but this steadily picked up through the morning. It was almost on verge of light rain, but stayed dry. My speed was about 2/3 of normal as I pushed into the wind. Just outside Norseman a caution sign had pictures of a camel, kangaroo and emu with unfenced road 150 km. On cue, an emu walked by the sign. A short while later, five more emus. I continued slowly upwind towards Fraser Station. At 102 km was the turnoff. Unfortunately as I came to the gate 500m from the road, saw sign "Due to family tragedy, we are closed until further notice." Oh well, continued further until the next parking area at 108 km. There was an emergency phone here and small pulloff with a few trash bins. Enough to pitch camp and finish reading a book before it got dark. 108 km today, 17183 km cumulative.